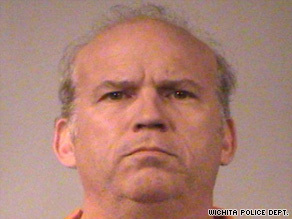 But Roeder says if he's convicted, "motive was the defense of the unborn"
WICHITA, Kansas (CNN) -- An anti-abortion activist suspected in the death of Kansas doctor George Tiller told CNN on Tuesday the closing of Tiller's women's clinic is "a victory for all the unborn children." Scott Roeder, charged in the death of Dr. George Tiller, spoke to CNN on Tuesday. Scott Roeder, 51, would not admit to CNN's Ted Rowlands that he killed Tiller, who was gunned down at his church May 31. But he said if he is convicted in Tiller's slaying, "the entire motive was the defense of the unborn." Tiller's family said Tuesday the clinic he headed will permanently close, effective immediately, and they would issue no more statements. At the time Roeder was interviewed Tuesday, word of the permanent closure had not come out -- but when told the clinic had been shuttered since Tiller's death, he said, "Good." Dan Monnat, Tiller's attorney, declined to respond to Roeder's comments on the family's behalf. But in an e-mail, he added, "Speaking for myself ... I am reluctant to in any way legitimize Mr. Roeder, or anything he stands for, by directly responding to his statements. "I am content to let law enforcement determine whether anything he says merits attention. I do not encourage anyone else to give Mr. Roeder or his extremist views any additional attention as he awaits trial," Monnat wrote. Tiller, 67, was one of the few U.S. doctors who performed late-term abortions. He had already survived one attempt on his life before he was slain, and the announcement by Tiller's family dismayed supporters of abortion rights. Nancy Keenan, the president of Washington-based NARAL Pro-Choice America, called Tiller's killing "part of an ongoing pattern of extreme anti-choice violence and intimidation" aimed at depriving women of a legal medical option. "It is a sad day for our country when family members who stood by their husband and father as he endured countless anti-choice attacks are forced as a result of his murder to make a decision like this one," Keenan said in a statement issued Tuesday afternoon. Nancy Northup, president of the Center for Reproductive Rights, expressed hope that other doctors "will be brave enough to come forward and continue Dr. Tiller's critical work of providing services to women." "It is unacceptable that anti-abortion intimidation and violence has led to the closing of Dr. Tiller's clinic. It illustrates the ongoing harassment endured by abortion providers and the resulting disservice to women across this country," Northup said. Roeder is jailed on first-degree murder and aggravated assault charges in Tiller's death. A Kansas judge earlier this month set his bail at $5 million. Tiller's family said Tuesday it is "proud of the service and courage shown by our husband and father," and that it would honor his memory "through private charitable activities." The statement promised his patients "that the privacy of their medical histories and patient records will remain as fiercely protected now and in the future as they were during Dr. Tiller's lifetime." Peter Brownlie, president and CEO of Planned Parenthood of Kansas and Mid-Missouri, said he and his staff "fully respect and understand" the family's decision. "Their loss is immense -- they have lost a husband, father, grandfather and hero," Brownlie said in a statement. But the closure of Tiller's clinic "creates a significant gap in access for women and families in Kansas," he continued. "No one is providing that service between Kansas City and Denver." Most of the leading U.S. anti-abortion groups have condemned Tiller's killing and disavowed Roeder, saying they wanted Tiller's clinic shut down, but through peaceful means. Troy Newman, the president of one of those organizations, Operation Rescue, said in a statement on the group's Web site Tuesday that his group is "thankful that Tiller's clinic will not reopen and thankful that Wichita is now abortion-free." But he added, "This is a bittersweet moment for us at Operation Rescue. We have worked very hard for this day, but we wish it would have come through the peaceful, legal channels we were pursuing." Operation Rescue and other Kansas anti-abortion activists had supported a criminal investigation by former Kansas Attorney General Phill Kline, a petition drive to empanel a special grand jury to investigate the practice and efforts to get his medical license revoked. On its Web site, the group referred to Tiller as a "monster" who had "been able to get away with murder." But in a New York Times interview last week, Newman said closing the clinic because of the shooting would be cause for concern. "Good God, do not close this abortion clinic for this reason," he said. "Every kook in the world will get some notion." Roeder met with Rowlands for a half-hour Tuesday, talking on a phone through security glass at the Sedgwick County jail where he is being held. He initially was reluctant to talk, as he said he had been misquoted in another interview. But he gradually opened up, noting that he was giving the interview against the advice of his defense attorney. Roeder told CNN he is "feeling good," and getting encouraging letters from people around the country, many of whom he does not know. But he complained about conditions in the jail, saying he doesn't like being in solitary confinement and that the jail is "freezing." Associates have told CNN that Roeder was a regular among the protesters who routinely gathered at Tiller's clinic. Roeder's former roommate, Eddie Ebecher, has told CNN Roeder was "obsessed" with Tiller and in the past had debated whether to kill him. Relatives said Roeder had suffered from mental illness over the years and had refused treatment at times. He served prison time in Kansas in the late 1990s after being arrested with explosives in his car, but his conviction was overturned on appeal. But Roeder said Tuesday that reports he has mental illness or schizophrenia are "totally wrong." He acknowledged having a drug problem at one point, but said he has been off drugs since he was 28 years old and has no mental illness. Rowlands said he attempted to discuss Tiller's death with Roeder, pointing out that there were witnesses to the shooting and its aftermath who claim they saw Roeder leaving the scene and got a license plate from the car. Roeder nodded, Rowlands said, but still would not admit any culpability. But "He didn't say, 'I didn't do it,' " Rowlands said. "He didn't say, 'Get me out of here, I'm the wrong guy.' "
Federal civil rights prosecutors have launched an investigation into Tiller's slaying, the Justice Department has said. The inquiry will focus on violations of the Freedom of Access to Clinic Entrances Act and other applicable federal laws. Roeder was concerned about the possibility of federal charges, saying his lawyer has warned him that he will be facing them if he doesn't stop talking.